I am an administrator/CEO of Mother Teresa Catholic Elementary School. I started the school in 1998 with 20 students. Today we have 492 students. 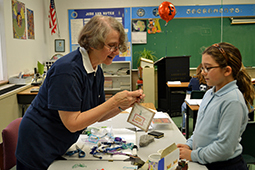 Mother Teresa Catholic Elementary School (MTCES) is a private Catholic Elementary School in the West Chester and Liberty Township in Butler County, Ohio. MTCES is a K–8 elementary school. Our mission and goal is to form strong Christian young men and women who are confident in themselves and have a strong relationship with their God. They will be men and women who make a difference in their environment and realize that they have a responsibility to those less fortunate. My job is working as a team with 45 faculty and staff to create an environment where respect is the motivating factor of the school. The youngest kindergartner is as important as the oldest eighth grader. Child is as important as an adult. To truly live this is challenging but very rewarding. Sadly, I am the only Sister involved here at MTCES; there is no one too close to this area. However, I do feel the support from the Salem Heights Sisters, my Cluster and Sisters Mary Garke and Joan De Christopher. I think often of our mission/charism/spirituality and realize that in an indirect way I am carrying out our mission/charism/spirituality. I firmly believe that we need to continue to reach out to the upper middle class as they are the ones who are the go-getters and doers for those less fortunate. Everything today stresses being rich, owning bigger and bigger houses, cars, etc. Look at the commercials today and you realize that a Lincoln is something we should all strive for. The poor are lost. If we do not shape the conscience of the upper middle class the poor will be truly lost. I do love working with children as they are our future. I feel my life as a Sister of the Precious Blood is a witness to those I touch. I feel blessed by God for a wonderful life. 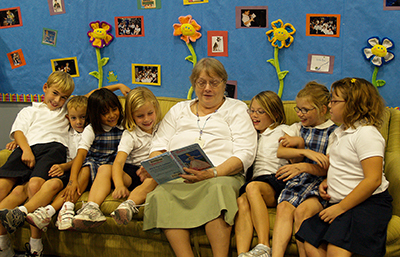 I recently retired from teaching elementary school for 47 years, mostly at St. Pius X School in Flint, Michigan. There I was also involved in CCD, RCIA, and Girl Scouts. Now that I have moved to Dayton I belong to the Salem Heights choir and assist with liturgy and sacristy work at the Maria Joseph Center. My main job is at the Brunner Literacy Center. At first I tutored several students and did secretarial work. Later, I became program coordinator at a new site we opened on Brown Street, in cooperation with Catholic Social Services, for tutoring refugees in English. Now I coordinate the Riverview site, where we tutor adults in elementary education. I lived at Orchard House for a short time. Now I live at the novitiate house at Amherst Place with Sister Marita and novices Bela, LaKesha, and Mumbi.